So many different places claim to have "the best" of something. The best french fries. The best customer service. The best wine. Of course "the best" can really depend on personal preference and everyone may not agree. All that aside, I feel confident in proclaiming this to be the best carry-on bag and hopefully many of you will agree if you have one or buy one. As you may have so cleverly figured out from the title, this fabulous bag is call The Aeronaut. It is made by Tom Bihn, a company based out of Seattle that makes travel bags, laptop bags, etc. Yes these bags are made right here in the USA. It's a backpack and a duffel bag all in one so you can choose how you want to carry it although I recommend it as a backpack. It is comfortable to carry as a backpack. 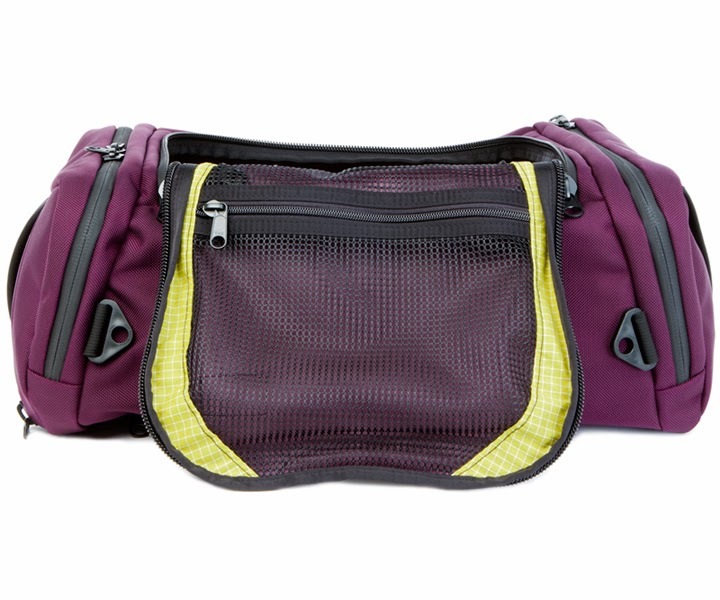 The shoulder straps are adjustable and well padded (they have a compartment they can zip into when not being used). There is a sternum strap and you have the option to get a waist strap to further secure the bag and distribute weight. I didn't originally get the waist strap but I plan to. It's lightweight at 3lbs 1oz. I am a small person so this was a big selling point to me. Your stuff is already going to have weight so why have a heavy bag on top of that. 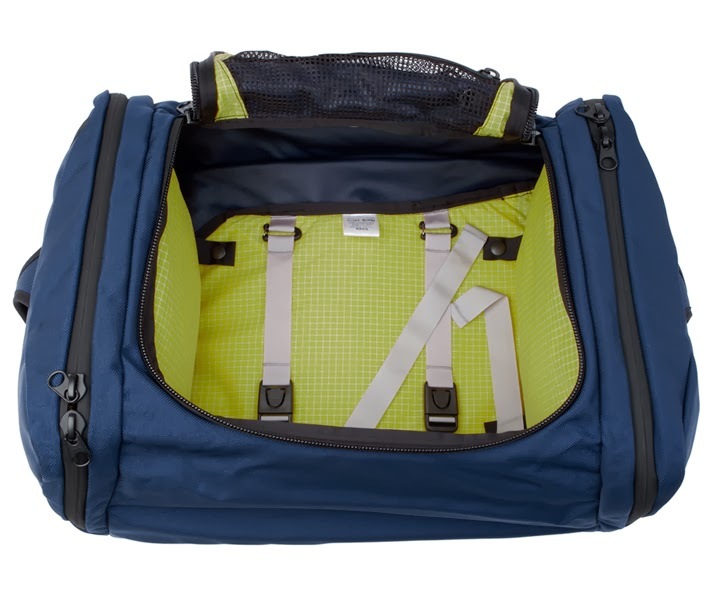 It has 3 main compartments to organize your stuff - the big middle compartment has tie down straps which are great to keep clothes from shifting and the two end compartments ensure even more stability for the middle compartment and still fit a lot. You can easily maneuver through the airport, planes, trains, crowds, etc. since you are wearing your luggage on your back and not wheeling it behind you. You can take the stairs while everyone is waiting for the elevator or escalator. It easily and quickly fits in the overhead compartment since it is a duffel type bag and not a suitcase with hard edges. As a last resort on short trips where they run out of overhead room and others have to check their bags, it could fit under your seat. The grab handles make it easy to pull down from an overhead compartment. It is really well made. You can easily tell it was constructed with great materials meant to last a very long time (that you can read all about on their website). The fabric and zippers are even water resistant. It is not a cheap bag at $250, it's a long term investment. And a really great investment for someone who travels. It comes in a great selection of colors. After talking with the very helpful customer service person I decided on Aubergine. I wanted to make sure it wasn't a Barney purple but it is a lovely eggplant color. It's a great color if you don't want a basic color but also don't want it to stand out in a crowd with a bright red bag or something. My second choice would have been Steel, the gray color. The first time I carried this bag was on our 2 week trip to Europe last summer and it was amazing. I only brought this bag and a fabric shoulder bag as my luggage and everything fit (see picture below)! I am going to do another post sometime on everything I brought and how I packed it. It was wonderful being able to walk from the apartments we stayed in to and from the train stations and through the trains and buses without dragging anything behind me. I so wish I had this bag when we went to Italy in 2011. I also took the bag on a weekend trip to Chicago and lent it to my SIL for a 6 day trip she took to Maryland. 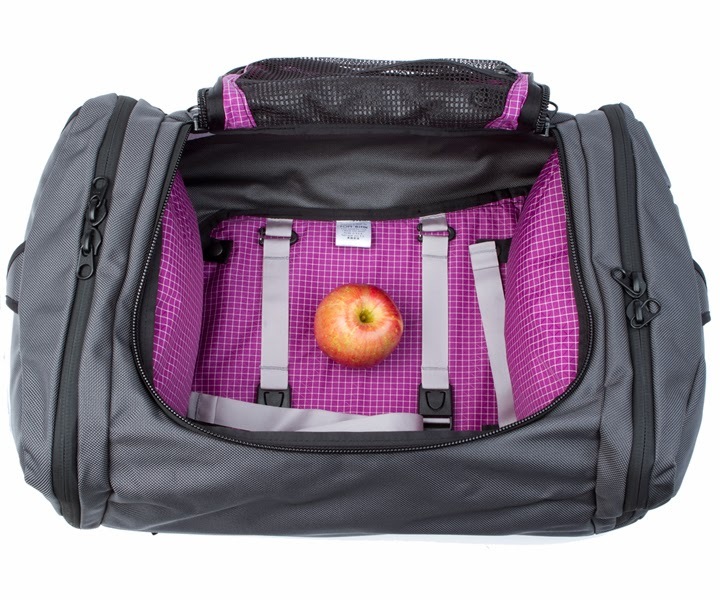 Even if you are not someone that thinks this can be your only bag on a long trip, it is much better to carry this on your back and only wheel one suitcase instead of two. The inside of my bag is the Wasabi color. Is this a color I would ever wear? No. Is this a color I would paint a wall in my house? Probably not. Is it easy to see the contents inside my bag? Yes! I was planning to go with the Aubergine/Ultraviolet combo until the customer service person said the Aubergine/Wasabi was the most popular combination because it was a great contrasting color and made things easy to find. Sold! It is completely true and although it's not a color I usually like, it doesn't matter because it is not on the outside of the bag anywhere. Steel with Ultraviolet would also be a good combination or the Navy or Black with Wasabi. 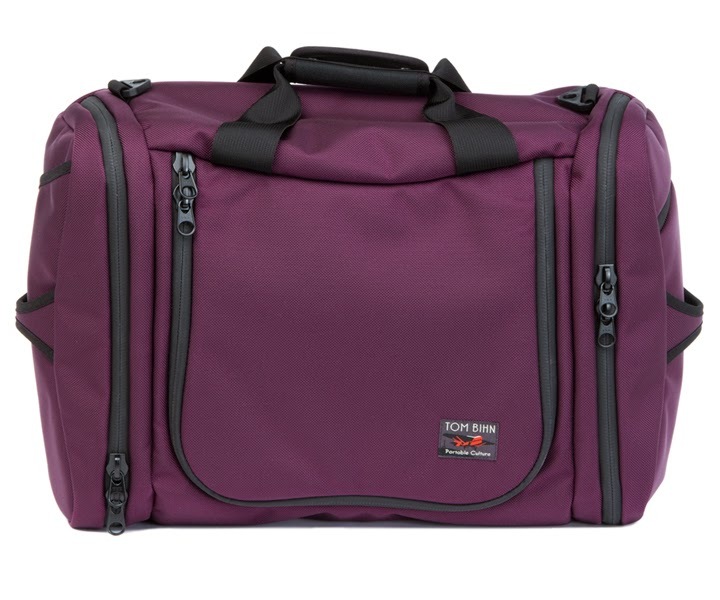 If you still don't believe me that this is the best travel bag around, you can read all the glowing independent reviews on the Tom Bihn website. I cannot wait for all the future trips with this bag! If anyone else has the Aeronaut or buys one I would love to hear what you think! This bag is RIDICULOUSLY awesome! I absolutely loved three compartments and it was the perfect 6 day trip bag...I think we both KNOW I'll probably always check a bag for our overseas excursions! :) I will be buying two very soon--one for Keith and one for me! If anyone is on the fence, take it from this overpacker--this bag will at least let you move more freely (like Emily mentioned) and the difficulties of rolling two suitcases can be avoided--worth it in my opinion! That bag looks great!! I've never used a duffel-type backpack before, but it looks like it would be just perfect for casual travel! Angela - it really is! I would have never thought I would like a duffel/backpack as a carry on but I cannot say one bad thing about it. I even use it for weekend trips where we are driving somewhere because it is just so easy to use. I just ordered the aubergine/wasabi combo. I spend a week in Kauai every year, and I think this will be perfect! Three comparments? That's terribly awesome. Where can I get that terribly awesome bag?